The EUthyroid consortium met for the third time at the EUthyroid project meeting held on 7 – 8 September 2017 in Belgrade. The meeting gave all work package leaders the opportunity to present and discuss progress over the past 12 months and outline their detailed plans for bringing the project to a successful conclusion. Difficulties encountered and potential solutions were discussed. 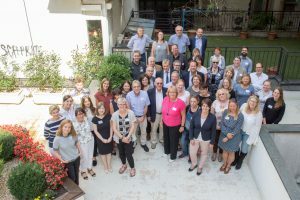 51 representatives from 29 project partner institutions attended the meeting, with all national managers given the chance to report on their national activities and discuss progress in bringing EUthyroid outcomes to the attention of policy makers. This meeting fell at a crucial time for the EUthyroid project as we move into the last 9 months of the project and our focus lies not only on bringing the scientific work to a successful conclusion but also to ensuring that the projects outcomes are disseminated as widely, and with as much impact, as possible. A key part of this effort will be played by the many regional managers in the consortium and therefore considerable time and attention was dedicated to discussing the situation in the various countries and the strategies for addressing policy makers at a national level across Europe. In light of the achievements of the project and the extensive infrastructure developed to ensure standardisation of future studies, another key topic of discussion was ways in which to ensure that the project continues in some form after the funding period is over.